LTO-4 tape media provides 800GB’s of native capacity, 1.6TB compressed at a transfer rate of 120MB/s native and 240MB/s compressed. The LTO-4 tape has more installations than any other tape format and is ideal for large systems backups or suitable for archival purposes and provides peace of mind from the world’s largest manufacturer of LTO tape media. Sony media cartridges are manufactured to the highest industry standards for quality and reliability, ensuring low error rates, high performance and long-term durability. Sony media allows you to archive your data with confidence. The Sony media family offers you more choices to better manage your data over time. Our LTO Ultrium tape format has been optimised for high capacity and performance with outstanding reliability, in either stand-alone or automated environment. 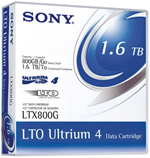 The Sony LTO Ultrium tape product line ranges from 200GB* to 15TB* capacity per cartridge, making it an ideal choice for capacity specific backup and archive applications. All Sony LTO tape media has a lifetime guarantee against defects. If for any reason your LTO-4 tape becomes defective Sony will send out a replacement. In addition to this if the media fault leads to data loss and it has been kept in the correct environmental conditions and used correctly Sony also provides a tape data recovery service. If purchasing 20 or more pieces of Sony LTO-4 tapes we can provide you with printed barcodes for use in your LTO tape library that have the correct barcode sequence. Read more about why Sony is a world leader in LTO tape technology.